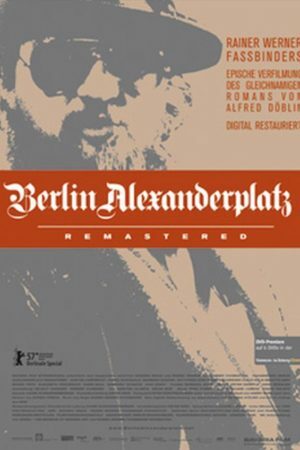 The first thing that everyone knows about Rainer Werner Fassbinder's 1980 adaptation of Alfred Döblin's 1929 novel Berlin Alexanderplatz is that it is long, one of the longest narrative films ever made, clocking in at more than 15 hours (more than 15.5 in the American, NTSC version). Everyone knows this because it is not an incidental detail: the film's effect relies completely on there being so much of it, and indeed the length ultimately becomes a theme in and of itself. The fact that the film takes so long in telling its story is as important to its overall meaning as anything within that story. This "film in 13 parts and an epilogue," as we are told at the opening of every chapter, is the study of roughly 18 months in the life of Franz Biberkopf (Günter Lamprecht) released from prison in Berlin in the summer of 1927 after serving four years for killing his lover Ida (Barbara Valentin) in a moment of insanity. Biberkopf vows to live on the straight and narrow, but the dour economy of Weimar Germany makes that a hard promise to keep, and before too long he falls in with pimps and smugglers, chief among them his dark twin and the object of his homosocial desire, Reinhold Hoffmann (Gottfried John). Meanwhile, he drifts through a series of brief but passionate love affairs, until his former lover Eva (Hanna Schygulla) introduces him to the childlike Emilie Karsunke (Barbara Sukowa), whom Franz nicknames "Mieze." "The crucial part of Berlin Alexanderplatz isn't the story...its structure is, if possible, even more ludicrous than that of Goethe's Elective Affinities - the essential part is simply the way in which this incredibly banal and unbelievable plot is narrated. And the attitude toward the characters, whom the author exposes in all their dreariness to the reader, while on the other hand he teaches the reader to see these characters, reduced to mediocrity, with the greatest tenderness and to love them in the end." Every word of that could also apply to Fassbinder's film, in which the plot creeps forward in tiny bits and pieces, in which some of the important moments happen off-screen and are alluded to so elliptically that we might be forgiven for failing to notice they have taken place at all. There is one full hour-long episode - Part 4, "A Handful of People in the Depths of Silence" - that goes by without advancing the plot or even any of the subplots by one iota. These facts do not bother us; they are the very heart of the film. Instead of filling its great length with a sprawling story, such as in Gance's Napoléon, Bondarchuck's War and Peace, or more recently Jackson's The Lord of the Rings or Giordana's The Best of Youth, Berlin Alexanderplatz is filled with a sprawling character, Franz Biberkopf, who we get to know better than just about any other figure in the history of cinema. With only a very few exceptions (including the climax of the story in Part 12), Biberkopf is rarely off-stage, and the entire story is filtered through his perceptions of reality. It should be pointed out that this is not the case in Doblin's novel, filled with multiple narrators serving to build up a portrait of individual men and women living against the vibrant backdrop of Berlin in the waning days of Germany's Republic. Nothing about the backdrop to Fassbinder's film could rightfully be called "vibrant," although it is certainly lived-in. His career was largely centered around explorations of character nailed down to a certain time and place, although he was not in the habit of exploring the worlds he created so much as positing that they existed. I have seen none of his films where that was clearer than this one, which deliberately trades in Doblin's social panorama for a Weimar Berlin stripped of almost all of its signifiers except where they are important for our understanding of Biberkopf, not history. That's not to say that Fassbinder's films, here and elsewhere, aren't intensely physical. The rooms and streets of Alexanderplatz are not terribly well-realised in and of themselves, except in the details that reflect on Biberkopf's perception of them (in particular, many of the outdoor sequences feel unmistakeably stage-bound), but they are fully three-dimensional; between the careful manipulation of focal depth (although on 16mm, there's not a whole lot of manipulation to be done), and the liberal use of dolly shots, this film is perhaps Fassbinder's greatest triumph of directing within space. This was his first project with cinematographer Xaver Schwarzenberger, stepping in for Michael Ballhaus, the director's longtime collaborator with whom he'd recently had a personal falling-out; while Schwarzenberger's work is not quite as powerful as his colleague's, it is still a work of great precision, with a level of tactility rare for the cinema. Most of the 15 hours takes place over some very long takes, often several minutes at a time, allowing us to fully dwell in the physical places of the film, leading Tom Tykwer to note, in an essay commissioned for the 2006 remaster of the film, "the cut takes place in the camera, as it were, by moving the camera position with the dolly and changing the frame by zooming." Undeniably true, and it is certainly the case that the composition of frames serves a similar purpose, actively incorporating the imagery into the "edit" by breaking up action with doorways, window frames, various bric-à-brac and above all seemingly omnipresent mirrors, making frames within the frame that serve to further divide the long takes into shorter chunks of action. But the fact of the matter is, even the most urgent and innovative style will begin to grow unremarkable, if not stale, by the end of 15 hours, and thus all the formal elegance in the world cannot explain the film's theme, which is: Franz Biberkopf. 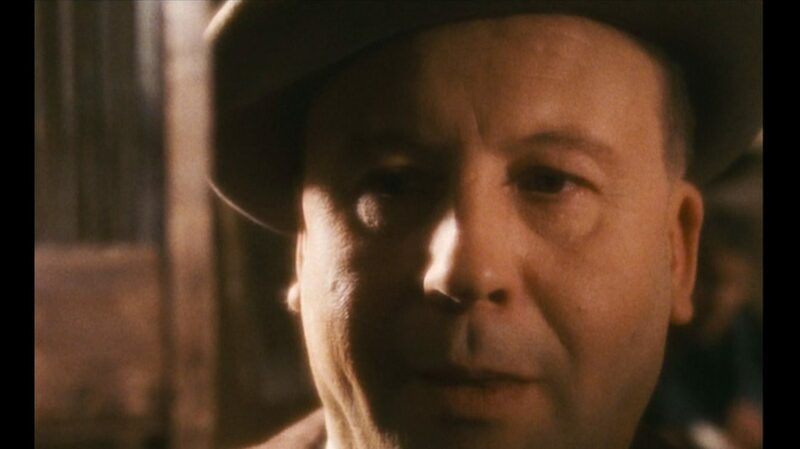 One might expect that in a film this long, Biberkopf's character will grow by familiarity - that as we spend more and more hours in his presence we will learn more and more about him - and the amazing thing about Berlin Alexanderplatz is that precisely the opposite occurs. This is not a film where meaning is created by the slow accumulation of details, but by their stripping-away: Biberkopf is not a complex man, when all is said and done, and we think we have his number fairly early on, that he is a childlike brute with a violent sexual appetite and a desire to be better than he is even as he lacks the comprehension to understand what that entails. Which is all mostly true, but as the film winds on layers are stripped away from him, leaving him naked at the end, reduced to his most direct impulses, a reduction that leaves him literally insane. Ah, the end. For 13 episodes, Berlin Alexanderplatz is one thing, and then the epilogue is something almost incomprehensibly different. Impressionistic where the rest of the film has been descriptive, blending elements of cinematic imagery nabbed from a lifetime of movie-going, it's easy to see what Fassbinder wanted to do with the end and hard to tell if he succeeded. There are many ways to watch the film, and I think that changes the ending; it was originally screened on television, one part on 14 consecutive nights, and I think that would make the ending a bit of a letdown, somewhat shallow and chaotic for its own sake. But for my part, having watched the film in essentially one sitting, the dreamlike finale was not just a trip into the muddled mess of Biberkopf's mind, but into my own, as well: the components of the movie were starting to run together in my mind by then, and watching them freely clash in a constantly-shifting setting felt right, however it worked or did not intellectually. Enough of that tangent: this is the story of Biberkopf in full and not just where he ends up. It truly is one of the greatest character studies imaginable: a subtle and completely persuasive account of a man's journey from insensate brute to a small, scared figure that we could almost fit into the palm of our hands. The way that this arc is carried off, in the repetition of scenes and phrases, symbolic imagery in the sets and costumes, and even in the details of the magnificent performances throughout the film, freely blending theatrical declamation with more intimate "filmic" acting, these things I will leave to the viewer. Because, by all means, Berlin Alexanderplatz demands to be seen: one of the grandest achievements in the history of the cinema, never once indulgent or too broad, and surely the swiftest 15 hours that have ever been filmed.